Thanks to calls for compassion from animal welfare advocates, officials at a zoo in India have been forced to cancel plans to separate two chimpanzees who've been companions for the past 20 years. 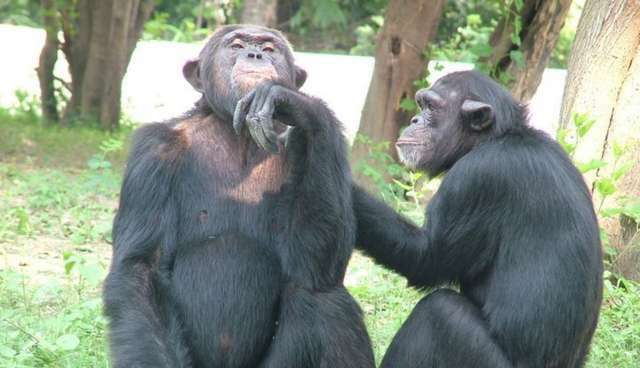 The lifelong friendship between Jayson and Nikita, the only chimps held in captivity at the Lucknow Zoo in Uttar Pradesh, was thrown into jeopardy last week when officials there announced that Nikita would be sent to another zoo to mate. But those plans have changed, potentially preventing an early death from the heartbreak of being apart. "It has finally been decided that Nikita and Jayson will continue to live together in Lucknow zoo," zoo director Anupam Gupta told the Times of India. "There is no conservation purpose nor welfare of animals that arises out of breaking an established pair of chimpanzees and attempting to pair them with other partners. In fact, such irresponsible experiments could seriously compromise their welfare, at times even proving fatal for the separated pair." The controversy surrounding this planned separation may have a positive effect beyond just Nikita and Jayson alone. It has been revealed that Nikita's intended suitor at the other zoo is currently being kept without a companion, a violation of Central Zoo Authority guidelines. Sadly, while Nikita and Jayson will be allowed to remain together, transferring bonded animals for breeding purposes is a common practice in zoos throughout the world, and animal advocates say it's just another way zoos put profits above the well-being of their residents.